White glass cylinders diffuse light from within the open sphere frame of this bronze pendant light. 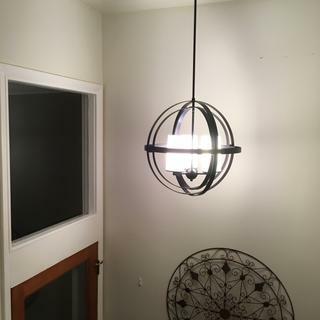 Brighten a foyer, dining room, and more with this three-light sphere pendant. It features three white glass cylinders inside the open frame design to help diffuse light for a soft glow. 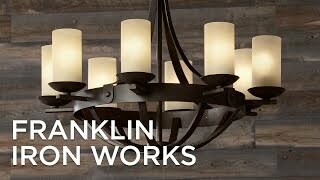 From the Franklin Iron Works™ lighting collection. 21" wide x 21 1/2" high. Candle glass is 7 1/2" high x 4" wide. Canopy is 5" wide x 1" high. Weighs 16.98 lbs. Includes one 6" and three 12" downrods and 52" of cord. Sloped ceiling adaptable. Uses three maximum 100 watt standard-base bulbs (not included). 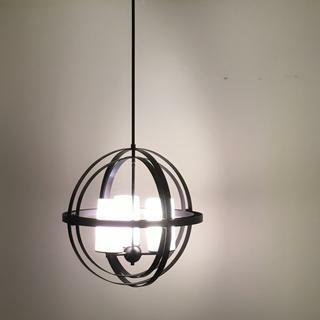 Open sphere pendant light, from Franklin Iron Works™. Round orb shape and profile; bronze finish frame; white candle glass. I liked the style and the fact that it can take up to 100 watt bulbs. Can this fixture be installed without a down rod? Can the fixture be attached directly to the base? Can the down rod be cut? BEST ANSWER: Hi Kate - I am sorry, this is only designed to be mounted with the rods. At least the 6" downrod must be used and it cannot be shortened. You do not have to use the full length of the down rod. It can be shortened. I did not ask the electrician about attaching the light fixture directly to the base. O absolutely love my hanging lamp, it looks great! Very well made and easy to put together.. Still love it, despite small design flaw. We had this chandelier installed today. Our installer said it was very easy to put up- it was placed in a 16ft high foyer. It looks amazing from our street through the large window. I love the look of this chandelier, except the metal base where the globes sit were bent inward a little towards the middle of the chandelier. My installer was afraid to try and bend them, as he said sometimes those things break. It wasn’t enough of a problem me to return it. I would give it 5 stars if it weren’t for that, but still a nice looking light. I wanted a light that allowed me to see while working on projects at my table. This is it! I had a dimmer put on (for LED lights), so that it doesn't have to be so bright when you want dimmer lighting. Easy to dust with my swiffer. Love Love Love!! Our light fixture is admired by all our guest!! Easy to clean. Comes with an extension and also can be installed with or without the rod depending on your ceiling height or taste. We also installed a dimmer to control the light. So happy with are purchase changed the whole look of our living space!! Great investment and great price!! The fixture itself is fine. But after waiting for a replacement for one of the glass enclosures that was found broken, the one we received on special order was not a match for the others, leaving us with yet another special order for a replacement.